G7593T Billy Duffy White Falcon, Hollow Body/Semi Hollow Body Electric Guitar from Gretsch in the Artist Signature series. 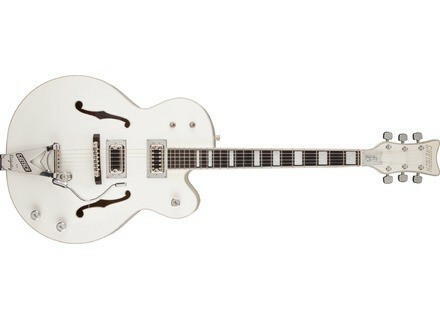 Gretsch adds to its Artist Series the White Falcon Billy Duffy Signature, an all-white archtop guitar. Featuring much of what Falcon fans hold dear, Duffy's inimitable guitar has several unique aesthetic differences that separate it from the rest of the "Falcon" flock, namely its period-correct '70s Baldwin-era styling, pure White gloss nitrocellulose lacquer finish, V-shaped Falcon headstock, Silver Sparkle binding, custom wound hot “Black Top” Filter'Tron pickups with three-point adjustable '70s-style metal bezels and Duffy's preferred Bigsby tailpiece. In addition, Duffy's signature bird of prey features a 17" wide, 2 ¾" deep single cut-away three-ply maple body with a three-ply maple arched top and back and two spruce parallel tone bars and sound post, a three-piece maple/walnut/maple neck with ebony fingerboard, a chrome-plated truss rod cover with Duffy's signature emblazoned on it, a chrome-plated output jack plate, pearloid wide-block fretboard inlays, '70s-style aluminum "G" arrow knobs and a premium gray speckled "Billy Duffy" case. No information about the price. Visit www.gretschguitars.com for all the details. [NAMM] New finish for the Schecter Corsair The semi-hollow Schecter Corsair guitar will be available in 2013 with a new Satin finish. [NAMM] New 2013 Fender Select Stratocaster HSS Fender adds in 2013 a new Stratocaster guitar to its Select Series, a model with an HSS pickup configuration.